A more accurate understanding of where your students are, both on and off campus. Ability to manage and enforce check-in processes for each location. Ability to keep track of when visitors are checked into a house / dorm. The Location Manager will be available from the Admin Console. 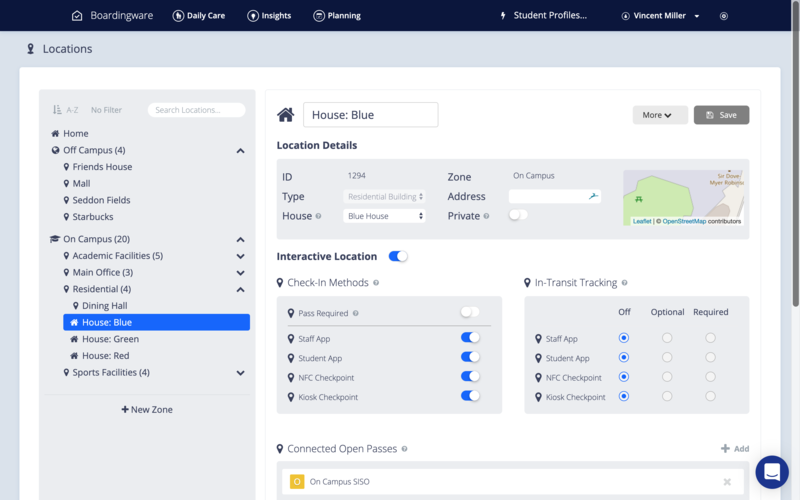 Organise on-and-off campus locations into a hierarchical format with different Zones and Sub-Locations. We've updated the names of some of our features. These changes are based on feedback from our customers and are designed to make Boardingware simpler, clearer and more universal for all kinds of schools. There are no changes to the normal leave type functionality. Only the names are changing. In alignment with the name changes, we've also updated the Sign-in workflow. The "Sign-in" action will be updated to "Location"
This action will work very similar to the existing Sign-in process, however, instead of only being able to sign students into one place (normally the boarding house), you can choose what location you'd like the student to be checked-in to. This adds more flexibility and makes it easier to quickly update a students location. As past of this update, we have made some improvements to your filters.